On the occasion of his 98th birthday, we wish Ludwik many beautiful blessed years – health, joy in the company of friends, respect and worldly friendship. How many scouting generations have been under his watch, greeted by the scout saying his “Czuwaj”! And he is still young, his age is just a number. He has a young spirit, he performs noble deeds, he is devoted to God, scouts and our fellow man. Well, what else can I say – when life loves someone so much, it means that that person still has many tasks to perform. He has somehow managed to live through his life adventures. He was born in the United States, but it was also his fate that he lives in the country on the Vistula. He went to Poland with his parents at the age of two. At the railway station in Czestochowa, taking advantage to him, he wanders away from them, simply curious about the world. Desperately looking for little Ludwik everywhere, they found him after three hours, healthy and smiling. At 12 years old he had a water experience. it was in Siedlątków, in the district of Turek. He jumped into the river to swim. The forces overcame him, and a strong current took the young “swimmer” and he began to drown. Such adventures of childhood and youth he could tell for hours. During the Second World War and the occupation of Poland by the Germans, he took a train to the American embassy in Berlin to get an American passport. He felt confident, because he was born American. Being in front of the embassy’s building, he leisurely lit a cigarette, but quickly straightened up as a military police officer approached him. Mr. Ludwik tells me: he kicked me and hit me in my side reminding me that I’m a pole and not an American and as a Pole I have to wear a Polish badge “P” on my lapel and not an American badge. It could have ended differently. Over 32 years, Mr. Ludwik Żabicki worked at the General Motors – Chevrolet division. At the age of 62 I decided to take advantage of early retirement – I wanted to live think maybe another 3 years and enjoy the life of retiree – he says. Fate, however, smiled at him. 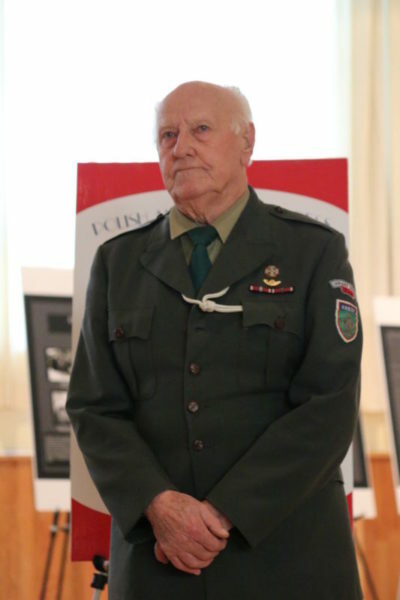 He has been retired already for 36 years which gave him more time to dedicate to scouting and other social activities. Life was not always carefree. After 46 years of marriage with Romana, Ludwik was a widower. After this sad experience he was able to find solace with the help of Stefania, who became his wife. I thought – maybe we can be married for two or three years together… Life was to be different. The Żabickis have been a married couple for 28 years. Seventeen grandchildren have blessed them – 12 boys and 5 girls. Druh, “harcmistrz” Ludwik Żabicki with his carefree spirit does not know what it is to have insomnia, a headache, lack of appetite. He says of himself that in this regard, he is a phenomenon. I agree – in many respects, Mr. Ludwik is a phenomenon… He writes poetry, he knows how to build and maintain a camp fire, he has earned so many merit badges that there is not enough room on his scout uniform for them all. Lucky the ones who have met and worked with him. I have been that lucky. Through the Polish Weekly newspaper, Mr. Ludwik wishes to thank George Lukowski for the pleasant and unexpected surprise – a birthday dinner at the restaurant of the Golf Club, where many kind and dear guests were invited including from Our Lady of Czestochowa, Fr. Andrzej Maślejak. It has been a pleasure to write this piece, and once again with the editorial team, we wish Mr. Ludwik God’s continued blessings for every day of his long life.